Once again, plans are afoot to create a Slow Food chapter here in Syracuse and the first meeting to get organized is tonight. Everyone interested in learning about Slow Food and the possibilities of forming a convivium here in Syracuse should come to Second Story Books at 5:00 pm at 550 Westcott Street. Paul Mercurio is leading this effort and has also set up a blog where you can keep track of Slow Food developments here in Syracuse. Check it out here. This is just one more sign of the interest and momentum that issues of eating locally and sustainably have garnered in our area. The work of the Central Leatherstocking Convivium based in Hamilton gives me great hope about what may be possible here. To read some of their past activities, click on the Slow Food category on the right and to learn more about Slow Food in general, check out their website. I had just graduated from college and my friends knew I loved to cook, so that Christmas one of them gifted me with a copy of the Joy of Cooking. I loved it. Having learned to cook at my mother's side and with the help of a 1938 edition of the Boston School of Cooking Cookbook by Fannie Farmer that my grandfather handed down to me, the Joy of Cooking was perfect. It was comprehensive, easy to follow, and a wonderful resource for expanding my repertoire of the classics. Almost ten years after receiving that first copy, the much heralded update appeared in 1997. THIS edition is the one I use frequently and when folks compliment me on my scones and pancakes, or chicken soup--I have to give the credit to this edition of Joy which gave me the base from which to explore my own take on these everyday standbys. Now there is a new edition. Seventy-five years after Irma Rombauer's classic, her progeny--Marion Rombauer Becker and her son, Ethan Becker--have added some 500 new recipes and have taken a few steps back. This is curious because this is also the team that brought us the 1997 edition I love. 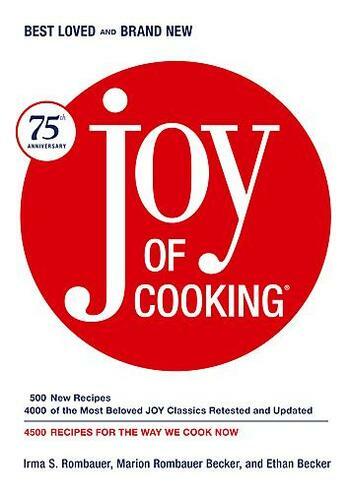 "Connoisserus of Joy noticed the 1997 version was a little more 'chef-like'--less geared toward home cooks; but in this, the 75th anniversary edition, the focus is squarely back on home cooking. The voice and spirit, definitely, are more in keeping with the original notes from Irma, and you'll find favorites they dropped or abridged in the last edition: There's more casseroles, more family fare, more convenience foods--no more 'everything should be made from scratch'!" Now, I haven't ever read or cooked from Irma's first editions so I don't know how much of a departure the 1997 revision actually was. But from the copy I used--issued in 1975--I couldn't tell too much of a difference. I'm willing to admit that the kinds of foods I like to cook and the way I prepared them had changed between 1988 when I first received that copy and when the 1997 edition was released. So it may be that I grew with the revision. I'm also willing to admit that in that interim I had spent several years in Berkeley, CA and discovered Alice Waters and seasonal cooking. I'm sure that had something to do with it. I had evolved, the Joy of Cooking had evolved and when we met up again in 1997 we were in the same place. But what is this, "no more 'everything should be made from scratch'"??? This isn't the Joy of Sandra Lee! For me, the joy of cooking is in the cooking from scratch. This just strikes me as very odd given the growing movement toward healthier eating, Slow Food, local, seasonal cooking, and the rest. I so much want the world to believe that it is possible to eat well and eat foods cooked from scratch while living a crazy busy life. A cookbook as influential and widely loved as the Joy of Cooking really has an opportunity to help make everyone from novice to "chef wannabe" home cooks feel comfortable enough in the kitchen to experiment with new ingredients, techniques, and methods. This doesn't mean that it would have to betray its heritage by adding recipes like quesadillas and ceviche--fine--take those out. But PLEASE if we are going to continue to cook the great classics of American cooking (casseroles and tuna bakes included) then teach us to cook them from scratch. I'm anxious to get my hands on this latest edition to see just what this is all about. But if any of you use the Joy of Cooking or have seen the new version--I'd love to know what you think. There is only one thing I like more than dining at one of my favorite restaurants and that is dining at one of my favorite farms. On Saturday night Harrison and I had the pleasure of sharing a feast with various friends and members of the Central Leatherstocking Slow Food Convivium hosted by Suzanne and Aaron of Green Rabbit Farm. We thought we might share the pleasures of the table with author Nina Planck who was supposed to be in town for a book signing. But Nina had to cancel at the last minute and lucky for us, Suzanne and Aaron threw a dinner party anyway. Now you have to understand--I eat their food all the time. Their mixed salad greens and bread have provided many a supplement to my garden pickings. In the winter, I feasted on their root vegetables--some of the most beautiful carrots I've ever seen--or tasted. But it isn't just me. Suzanne and Aaron are generous enough to donate extra produce to the Grace Church food pantry. The folks who come to the pantry each week usually only get dry goods and meat. But a few weeks a year--folks who don't often have the funds to purchase any fresh vegetables get treated to the most delicious organic tomatoes and root vegetables to be found anywhere. Green Rabbit was already cool in my book but that kind of generosity puts them off the charts. 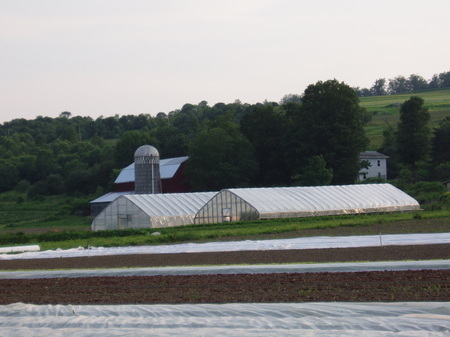 And this isn't the only contribution they make to our community--but things like this helps me to see the incredible value small farms make to our common life in addition to growing food. Yet, for all the idyllic setting and the opportunity to play a crucial role in their community, Suzanne reminds me that providing all that food is incredibly hard work. Just as you would expect on a farm, days begin very early and end late. And, what's that about a day off??? Suzanne typically bakes some 250 - 300 loaves of bread each week--and you can see the greenhouses and fields--that's alot of work. All so we can eat. Hmmm. But this is their life. I think both Suzanne and Aaron are younger than me and I continue to be impressed at how they've chosen to respond to what must be a calling. So on a cool and comfortable evening, while the baby chicks ran around and laughter floated across the fields, we enjoyed grilled lamb, roasted carrots and potatoes, baby greens, and some of the finest artisanal bread there is. And oh yeah, freshly made grape and vanilla bean gelatos with double chocolate cookies--I'm sure there were cocao nibs in there! All this, just a couple of yards from rows and rows of baby lettuces still in the ground. That's local food for you. Fantastic hosts, wonderful new friends and fresh food--I mean really. This is the Good life in Central New York. Green Rabbit Farm, Madison, NY, www.greenrabbitfarm.com. Green Rabbit Produce is sold at the Hamilton Farmers Market each Saturday. Look closely. Yes that is what you think it is. Actually, this photo was taken before the snow really began to come down! That's right snow! Just five minutes after it had been hailing. About an hour later the sun was so bright driving back to Syracuse that I had to grab for my sunglasses for all the glare. You gotta love Central New York. But this is the tip of the iceberg. 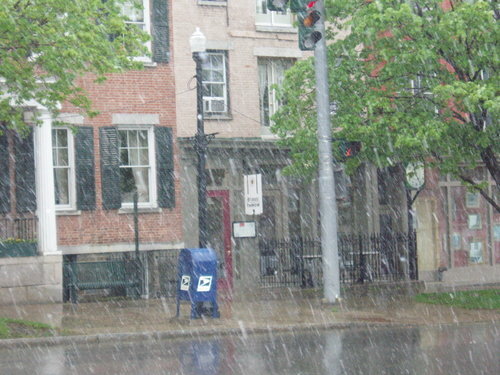 One of the many things to love about Central New York is the reason I was out in a sudden May snowstorm to begin with--a wine and cheese tasting sponsored by the local Slow Food Convivium held at Circa Restaurant in Cazenovia. I had some last minute change of dinner plans so I was able to hang out for a couple of hours with some wonderfully passionate foodies and farmers and enjoy New York State farmstead cheeses and wines from the Finger Lakes, Long Island and Niagara regions. 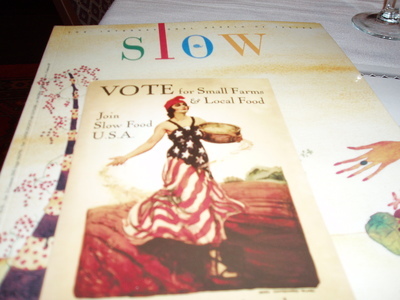 It was a fun and affordable event that provides me another reason to say--join Slow Food! 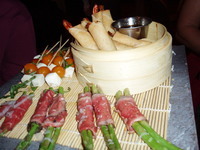 Slow Food is all about celebrating good food, food traditions and the pleasure of sharing it with friends--new and old. 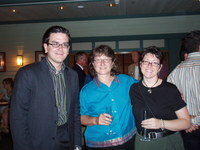 The Central Leatherstocking Convivium (think local chapter) has held some fantastic events and dinners over the past few years and a new Convivium is beginning in Syracuse--I'll keep you posted. So you'd think that that would be enough excitment for the day but I still had dinner to prepare. I had chicken marinating since the morning and was looking forward to trying out a recipe from Suzanne Goin. Well let me just say--you have to make this dish! 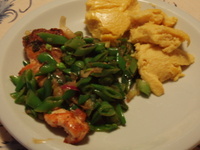 This Saffron Chicken with Parmesan Pudding, spring onions and sugar snap peas was amazing! It was relatively simple to prepare and it would be perfect dinner party fare--or just Sunday dinner fare--the kind you serve if you want to feel as if you having a fancy dinner out. The chicken was incredibly flavorful and we couldn't get enough of the crunchy sugar snap peas that had been sauteed in saffron butter. This dish represents how we're faring with the Eat Local Challenge--it is a mix. The chicken was not local but was sustainably raised. The spring onions came from a Hudson Valley farm but I picked them out on Saturday at the Union Square Greenmarket in New York City. The parmesan was made with a huge hunk of Parmigiano-Reggiano that I've had in the fridge for a bit but all the dairy products in it came from our good friends at Evans Farmhouse Creamery. 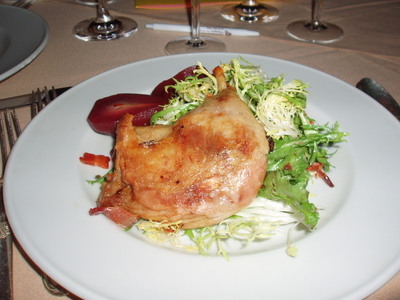 To top it off, we paired this dish with a bottle of the very rare and very delicious 2005 Pheasant Ridge Traminette wine. There were only about 20 cases of this wine made this year due to the weather this winter. I was told back in January that this was going to be a special bottling and it really is. 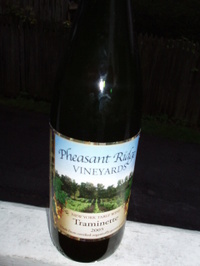 This wine is made from the Traminette grape--a member of the family of grapes that produce Gewurtztraminer. It is very different from the 2002 vintage--a bit cloudy in the glass, fragrant with fruit--pineapple and melon that carries through on the palate. This wine was made for drinking with food and it was absolutely perfect with the saffron chicken and parmesan pudding--I mean PERFECT. Check out the Pheasant Ridge website and place an order before they run out. This is a Central New York exclusive worth seeking. Note: Marinate the chicken the night before or the morning of serving. You can make the pudding ahead of time and refrigerate it covered. Bring it to room temperature about an hour before serving, rewarming it in a 400 degree oven 15 to 20 minutes uncovered, until it is hot and begins to brown slightly around the edges. For tonight's meal, I made the pudding first and prepared the chicken and vegetables while the pudding baked in the over--the timing was perfect. Toast the saffron in a small pan over medium heat until it just dries and becomes brittle. Pound the saffron to a fine powder in a mortar. Dab a tablespoon of the softened butter into the saffron powder, using the butter to scoop up about half of the powder. Set aside. Stir 4 tablespoons olive oil into the mortar, scraping carefully with a rubber spatula to incorporate all of the saffron powder. Toss the chicken breasts gently with the saffron oil, 2 teaspoons thyme, the parsley and the lemon zest, coating the chicken well. Marinate in the refrigerator at least 4 hours, preferably overnight. Heat a large saute pan over high heat for two minutes. Season the chicken with salt and pepper on both sides. Swirl in 1 tablespoon olive oil and wait a minute. Place the chicken, skin side down, in the pan (you might have to work in batches). Cook for 4 to 5 minutes, until the skin is crispy and golden brown. Turn the breasts over, reduce the heat to medium-low, and cook them a few more minutes, until just cooked through and springy to the touch. Transfer the chicken to a rack to rest. Return the pan to the stove over medium heat for a minute. 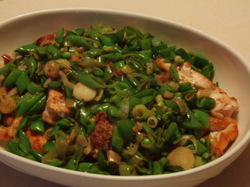 Add the remaining two tablespoons butter, and when it foams, add the sliced spring onions, sugar snap peas, 1/2 teaspoon salt, a pinch of pepper, and the remaining teaspoon thyme. Cook over medium heat 2 to 3 minutes, stirring until the onions are translucent. Add the saffron butter and one tablespoon of water. Swirl the pan, and when the liquid comes to a simmer, toss in the onion tops. Immediately remove from the pan from the heat and taste for seasoning. Arrange the chicken on a large platter and spoon the vegetables over it. 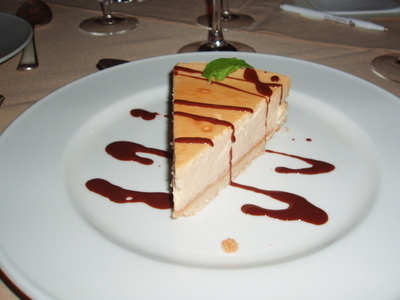 Serve with hot Parmesan Pudding. Heat a medium pot over medium heat for 1 minute. Add the butter, and when it foams, whisk in the flour, 1 tablespoon at a time, and cook for about 5 minutes, being careful not to let the flour burn. Slowly pour in the milk and cream, whisking constantly to incorporate it. The butter and flour will sieze up and get pasty first. Continue whisking vigorously as you add the liquid, and the mixture will become smooth. Cook a few more minutes, until warm to the touch. Remove the pan from the heat. Whisk the egg and egg yolk together in a small bowl. Slowly drizzle the eggs into the cream mixture, whisking continuously until combined. Stir in the cheese, and seaon with a heaping 1/2 teaspoon salt. Pour the mixture into an 8x6-inch (or equivalent) baking dish, and cover tightly with foil. Place the baking dish in a roasting pan, and add hot water tot he pan until it comes halfway up the outside of the custard dish. Place the pan in the oven and bake about 1 hour, until the pudding is just set. There is a real exciting synergy that is happening here in Central New York. Interest in eating local, supporting real organic standards, and living the Slow Food life are growing across our region. Kris Venne--the new coordinator of the Morningside Community Gardens got a nice write up in the recent Syracuse New Times and Valerie Jackson--formerly the converner of the Berkeley, CA Slow Food Convivium is now in our area and is the new co-leader of our local Slow Food Convivium. David Hollis, who blogs over at Rural Life 2.0 covers the scene in this report featured on WRVO--one of our NPR stations. He was gracious enough to include me in the interview. If you want to hear about the Slow Food movement here in Central New York--and get the scoop on Dutch Style Steak--click here. You can also learn more by attending the next Slow Food meeting on Tuesday, February 28 at the Hamilton Public Library at 6:30 pm. Send an email to Suzanne Slomin--also co-leader of our Convivium--at rabbit7@frontiernet.net to let her know you're coming. Shameless Plug Part Two is coming next week. The Central Leatherstocking Convivium held a Slow Food Wine dinner at the Craftsman House Restaurant on Friday and in these hectic days it was just what I needed. This event had a totally different vibe than the Slow Food dinner at Windhaven Farm in July. The menu had actually been published in the Syracuse New Times (without any mention of Slow Food) so the dinner provided an opportunity for those who knew little about Slow Food USA to learn more while for many others it was an opportunity for a reunion. Just a few comments before I talk about the food: Overall, the meal was better than I thought it might. It wasn't that I had low expectations, it just seems that the Craftsman House can be a bit inconsistent--just days earlier a friend had a meal there that she couldn't--wouldn't-- finish. My previous visit was fine but I was looking for an experience that would turn me into a regular repeat visitor. In general I thought the food was better than the wine. I was hoping for some spectacular wine pairings but in the opening announcements we were informed of the difficulty of finding a good New York red wine (lots of great choices for whites, we were told, but reds had a long way to go). A little asking revealed that the restaurant was limited by what was offered through its distributor. Though I'm not a wine or culinary professional--and so much of this is subjective anyway--I felt it was a missed opportunity not to be able to pair a bottle of Silver Thread Vineyard's Blackbird or one of the Channing Daughters reds. 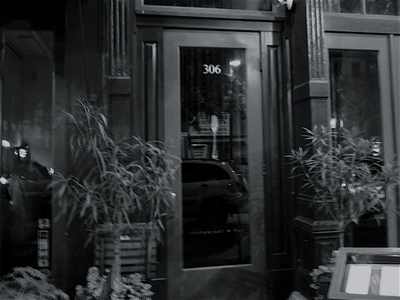 *the feelings of great anticipation and celebration that always seem to pervade Slow Food meals. *Suzanne Slomin's impassioned plea for folks to understand the true cost of food. She noted that organic food is not overpriced particularly when viewed against the reality of high healthcare costs, environmental damage, and diminished food taste and quality that are part of conventionally grown, industrial agriculture-produced food. 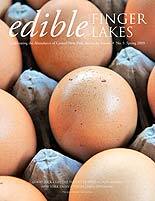 *Sharing the dining table with a mix of farmers, food co-op staff, a personal chef, and other lovers of good food. We really didn't need a conversation starter at our table but the Amuse Bouche got us going. 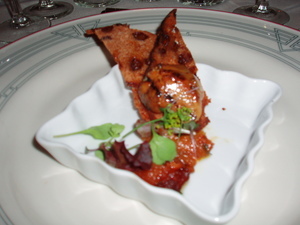 Foie Gras will always get people talking and this preparation was delicious--the wine pairing of a 2003 Dr. Frank Konstantin Semi-Dry Riesling worked really well. We reviewed the long-debated pros and cons of producing foie gras as we joyfully chowed down on this first course. The contrast between the compote, the toasted raisin bread produced by Green Rabbit Farm and the Riesling set the bar high for the dishes to come. One person at our table admitted that this was the first time he'd ever had an organ meat--what an introduction! I was a little surprised by the asparagus (not what I'd usually eat in September) but this was a fantastic dish. 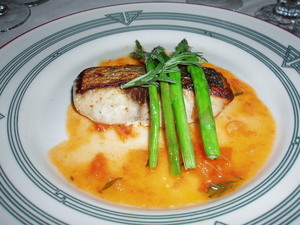 The tomato reduction was the perfect foil for the delicately flavored bluefish. This was paired with a 2003 Wagner Vineyards Gewurztraminer which I didn't like so much. The Gewurztraminer had a little too much going on and it seemed to overwhelm the fish so I ended up sipping more of the Riesling. As much salmon as I've eaten over the years I'd never come across, much less eaten, ivory salmon. One diner described it as a salmon that doesn't like shrimp (its the carotene in the shrimp that turn salmon pink). But this white-fleshed fish (common to souteast Alaska and Canada) "is also genetically predisposed with an extra enzyme to process that carotene rather than collect it in their flesh." (Stu Stein, The Peerless Restaurant, Oregon) So this was another mild fish--milder in taste than the more common Pacific Northwest wild salmon. 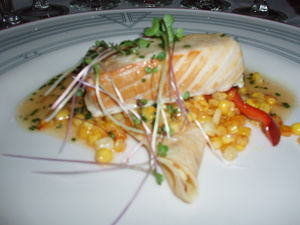 The roasted corn tucked in and around the crepe was crunchy, sweet, and spicy. The 2001 Standing Stone Reserve Chardonnay was a nice match. After two mild fish dishes this was a wake-up call of flavor. Some questioned whether it was the saltiness of the dish that accounted for it being the table favorite. I just know that the cilantro, tender duck and Asian spices made for a spectacular dish. 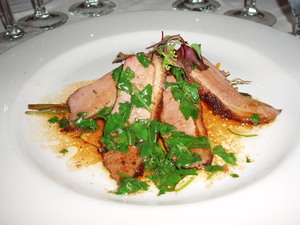 The 2002 Lamoreaux Landing Merlot that was paired with it had just enough body and fruit to stand up to the complex and strong flavors of the duck. I sopped up all the juices with some of Green Rabbit Farms crusty bread--the cleanest plate of the night. I wanted to like this dish, I really did. 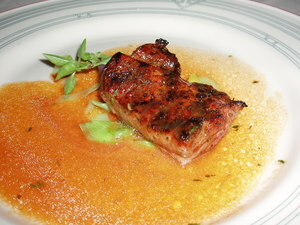 I generally like game meats but as much as I loved the sauce, I couldn't get behind the meat. It had an odd flavor to me with an aftertaste that I didn't favor. 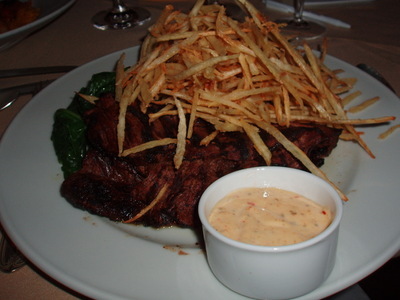 One tablemate wasn't sure his bison was fully cooked--not that it was rare, part of it was raw. So I only took a few bites of this dish and left the rest. The 2000 Pindar Pythagoras Meritage was lovely, though--and yummy enough to drink on its own. This was a lovely dish with which to end the evening. 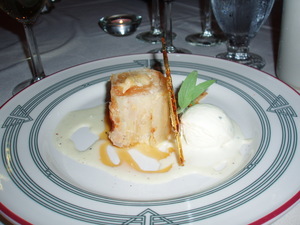 The strudel was a nice sophisticated turn on the traditional homey version--the anise scented creme Anglaise added an elegant touch. Maybe it was the late hour (by now we'd been eating for four hours) but I found no trouble going back and forth between sipping the 2002 Wagner's Late Harvest Vignoles and a cup of Paul de Lima decaf while I finished off dessert. The pushback from the table was hard for us all. It was a wonderful way to celebrate some of the best foods of the region and to do what Slow Food does best--gather new friends and old for a night of pleasure around the table.